Included in this purchase is a 40 slide PowerPoint presentation for "calling" bingo with a different measurement conversion problem on each slide (36 different problems). Conversions include inches to feet to yards to miles, mm to cm to m to km, ounces to pounds to tons, seconds to minutes to hours to days, and fluid ounces, to cups, to quarts to gallons. 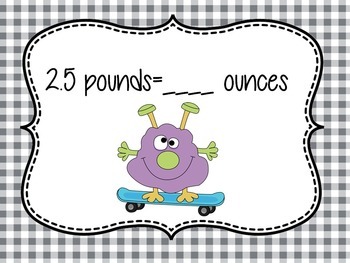 Each slide is also decorated with a monster clipart from www.mycutegraphics.com. Also included are blank Bingo cards (prints 2 per page). 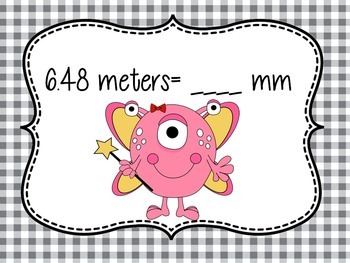 Simply print enough blank Bingo cards for everyone in your class. At the beginning of the presentation is a slide listing the 36 different number answers. Students randomly choose 24 of the 36 numbers and fill in their own Bingo card. (Make sure to tell them to put them in random order!) Once the Bingo cards are filled in, you are ready to play. Just click through the PowerPoint in order or rearrange the slides randomly making sure to keep track of the amounts you have shown so you can check the winner! I started using this method of playing Bingo years ago with my classes. The kids LOVE to fill in their own cards. 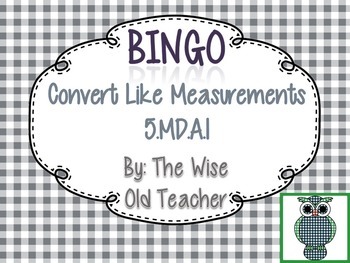 Another option is to copy and paste the integer answers into one of the many free online Bingo card generators and print the cards for your students. Of course, these slides can also just be used as a review or quiz type assessment.